The Chahamanas of Shakambhari (IAST: Cāhamāna), colloquially known as the Chauhans of Sambhar, were an Indian dynasty that ruled parts of the present-day Rajasthan and its neighbouring areas between 7th to 12th centuries. The territory ruled by them was known as Sapadalaksha. They were the most prominent ruling family of the Chahamana (Chauhan) clan, and were categorized among Agnivanshi Rajputs in the later medieval legends. The Chahamanas originally had their capital at Shakambhari (present-day Sambhar). Until the 10th century, they ruled as Pratihara vassals. When the Pratihara power declined after the Tripartite Struggle, the Chahamana ruler Simharaja assumed the title Maharajadhiraja. In the early 12th century, Ajayaraja II moved the kingdom's capital to Ajayameru (modern Ajmer). For this reason, the Chahamana rulers are also known as the Chauhans of Ajmer. The Chahamanas fought several wars with their neighbours, including the Chaulukyas of Gujarat, the Tomaras of Delhi, and the Paramaras of Malwa. From 11th century onwards, they started facing Muslim invasions, first by the Ghaznavids, and then by the Ghurids. The Chahamana kingdom reached its zenith under Vigraharaja IV in the mid-12th century. The dynasty's power effectively ended in 1192 CE, when the Ghurids defeated his nephew Prithviraja III. Coin of the Chahamana ruler Vigraharaja IV, circa 1150-1164. According to the 1170 CE Bijolia rock inscription of Someshvara, the early Chahamana king Samantaraja was born at Ahichchhatrapura in the gotra of sage Vatsa. Historian R. B. Singh theorizes that the Chahamanas probably started out as petty rulers of Ahichchhatrapura (identified with Nagaur), and moved their capital to Shakambhari (Sambhar) as their kingdom grew. Later, they became the vassals of the imperial Gurjara-Pratiharas. Several mythical accounts of the dynasty's origin also exist. The earliest of the dynasty's inscriptions and literary works state that the dynasty's progenitor was a legendary hero named Chahamana. They variously state that this hero was born from Indra's eye, in the lineage of the sage Vatsa, in the solar dynasty and/or during a ritual sacrifice performed by Brahma. In the later period, the Chahamanas were categorized as one of the Rajput clans, although the Rajput identity did not exist during their time. A popular medieval account classifies the dynasty among the four Agnivanshi Rajput clans, whose ancestors are said to have come out of sacrificial fire pit. The earliest source to mention this legend are the 16th century recensions of Prithviraj Raso. Some colonial-era historians interpreted this myth to suggest a foreign origin of the dynasty, speculating that the foreign warriors were initiated into the Hindu society through a fire ritual. However, the earliest extant copy of Prithviraj Raso does not mention this legend at all. Instead, it states that the first ruler of the dynasty was Manikya Rai, who is said to have been born from Brahma's sacrifice. Find spots of the inscriptions issued during the Shakambhari Chahamana reign. The core territory of the Chahamanas was located in present-day Rajasthan. It was known as Sapadalaksha (IAST: Sapādalakṣa) or Jangala-desha (IAST: Jangaladeśa). The term Jangladesha ("rough and arid country") appears to be older, as it mentioned in the Mahabharata. The text does not mention the exact location of the region. The later Sanskrit texts, such as Bhava Prakasha [hi] and Shabdakalpadruma Kosha [hi] suggest that it was a hot, arid region, where trees requiring little water grew. The region is identified with the area around Bikaner. The term Sapadalaksha (literally "one and a quarter lakhs" or 125,000) refers to the large number of villages in the area. It became prominent during the Chahamana reign. It appears that the term originally referred to the area around modern Nagaur near Bikaner. This area was known as Savalak (vernacular form of Sapadalaksha) in as late as 20th century. The early Chahamana king Samantaraja was based in Ahichchhatrapura, which can be identified with modern Nagaur. The ancient name of Nagaur was Nagapura, which means "the city of the serpent". Ahichchhatrapura has a similar meaning: "the city whose chhatra or protector is serpent". As the Chahamana territory expanded, the entire region ruled by them came to be known as Sapadalaksha. This included the later Chahamana capitals Ajayameru (Ajmer) and Shakambhari (Sambhar). The term also came to be applied to the larger area captured by the Chahamanas. The early medieval Indian inscriptions and the writings of the contemporary Muslim historians suggest that the following cities were also included in Sapadalaksha: Hansi (now in Haryana), Mandore (now in Marwar region), and Mandalgarh (now in Mewar region). The earliest historical Chahamana king is the 6th century ruler Vasudeva. According to a mythical account in Prithviraja Vijaya, he received the Sambhar Salt Lake as a gift from a vidyadhara (a supernatural being). Little is known about his immediate successors. The 8th century Chahamana ruler Durlabharaja I and his successors are known to have served the Gurjara-Pratiharas as vassals. In 10th century, Vakpatiraja I made an attempt to overthrow the Gurjara-Pratihara suzerainty, and assumed the title Maharaja ("great king"). His younger son Lakshmana established the Naddula Chahamana branch. Vakpatiraja's elder son and successor Simharaja assumed the title Maharajadhiraja ("king of great kings"), which suggests that he was a sovereign ruler. Simharaja's successors consolidated the Chahamana power by engaging in wars with their neighbours, including the Chaulukyas of Gujarat and the Tomaras of Delhi. The dynasty's earliest extant inscription (973 CE) is from the reign of Vigraharaja II. During the reign of Viryarama (r. c. 1040 CE), the Paramara king Bhoja invaded the Chahamana kingdom, and probably occupied their capital Shakambhari for a brief period. Chamundaraja restored the Chahamana power, possibly with the help of the Naddula Chahamanas. The subsequent Chahamana kings faced several Ghaznavid raids. Ajayaraja II (r. c. 1110-1135 CE) repulsed a Ghaznavid attack, and also defeated the Paramara king Naravarman. He moved the kingdom's capital from Shakambhari to Ajayameru (Ajmer), a city that he either established or greatly expanded. His successor Arnoraja raided the Tomara territory, and also repulsed a Ghaznavid invasion. However, he suffered setbacks against the Gujarat Chaulukya kings Jayasimha Siddharaja and Kumarapala, and was killed by his own son Jagaddeva. Arnoraja's younger son Vigraharaja IV greatly expanded the Chahamana territories, and captured Delhi from the Tomaras. His kingdom included parts of the present-day Rajasthan, Haryana, and Delhi. It probably also included a part of Punjab (to the south-east of Sutlej river) and a portion of the northern Gangetic plain (to the west of Yamuna). His 1164 CE Delhi-Shivalik pillar inscription claims that he conquered the region between the Himalayas and the Vindhyas, and thus restored the rule of Aryans in Aryavarta. While this is an exaggeration, it is not completely baseless. The inscription was originally found in Topra village, near the Shivalik Hills (Himalayan foothills). Also, the exiled ruler of Malwa (Vindhyan region) possibly acknowledged his suzerainty. Thus Vigraharaja's influence extended from the Himalayas to the Vindhyas, at least in name. Vigraharaja was succeeded by his son Amaragangeya, and then his nephew Prithviraja II. Subsequently, his younger brother Someshvara ascended the throne. 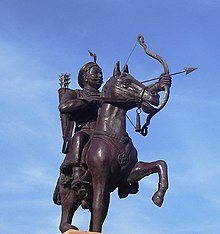 The most celebrated ruler of the dynasty was Someshvara's son Prithviraja III, better known as Prithviraj Chauhan. He defeated several neighbouring kings, including the Chandela ruler Paramardi in 1182-83, although he could not annex the Chandela territory to his kingdom. In 1191, he defeated the Ghurid king Muhammad of Ghor at the first Battle of Tarain. However, the next year, he was defeated at the second Battle of Tarain, and subsequently killed. Muhammad of Ghor appointed Prithviraja's son Govindaraja IV as a vassal. Prithviraja's brother Hariraja dethroned him, and regained control of a part of his ancestral kingdom. Hariraja was defeated by the Ghurids in 1194 CE. Govindaraja was granted the fief of Ranthambore by the Ghurids. There, he established a new branch of the dynasty. The Chahamanas commissioned a number of Hindu temples, several of which were destroyed by the Ghurid invaders after the defeat of Prithviraja III. Prithviraja I built a food distribution centre (anna-satra) on the road to Somnath temple for pilgrims. Someshvara commissioned a number of temples, including five temples in Ajmer. Vigraharaja IV was known for his patronage to arts and literature, and himself composed the play Harikeli Nataka. The structure that was later converted into the Adhai Din Ka Jhonpra mosque was constructed during his reign. The Chahamana rulers also patronized Jainism. Vijayasimha Suri's Upadeśāmālavritti (1134 CE) and Chandra Suri's Munisuvrata-Charita (1136 CE) state that Prithviraja I donated golden kalashas (cupolas) for the Jain temples at Ranthambore. The Kharatara-Gachchha-Pattavali states that Ajayaraja II allowed the Jains to build their temples in his capital Ajayameru (Ajmer), and also donated a golden kalasha to a Parshvanatha temple. Someshvara granted the Revna village to a Parshvanatha temple. ^ R. B. Singh 1964, p. 11. ^ R. B. Singh 1964, p. 89. ^ R. B. Singh 1964, pp. 10-12. ^ R. B. Singh 1964, p. 25-26. ^ Hiltebeitel 1999, p. 447. ^ Anita Sudan 1989, pp. 312-316. ^ Har Bilas Sarda 1935, pp. 220-221. ^ a b c Har Bilas Sarda 1935, p. 217. ^ Har Bilas Sarda 1935, p. 214. ^ a b Cynthia Talbot 2015, p. 33. ^ Har Bilas Sarda 1935, p. 223. ^ Har Bilas Sarda 1935, p. 224. ^ Har Bilas Sarda 1935, p. 225. ^ Dasharatha Sharma 1959, p. 23. ^ R. B. Singh 1964, p. 100. ^ R. B. Singh 1964, p. 103. ^ a b Dasharatha Sharma 1959, pp. 34-35. ^ R. B. Singh 1964, pp. 131-132. ^ Dasharatha Sharma 1959, p. 40. ^ R. B. Singh 1964, p. 140-141. ^ R. B. Singh 1964, p. 150. ^ Dasharatha Sharma 1959, p. 62. ^ R. B. Singh 1964, p. 156. ^ Cynthia Talbot 2015, pp. 39. ^ Iqtidar Alam Khan 2008, p. xvii. ^ R. B. Singh 1964, p. 221. ^ Dasharatha Sharma 1959, p. 87. ^ Dasharatha Sharma 1959, p. 26. ^ R. B. Singh 1964, p. 104. ^ R. B. Singh 1964, p. 124. ^ R. B. Singh 1964, p. 128. ^ a b Dasharatha Sharma 1959, pp. 69-70. ^ R. B. Singh 1964, p. 159. ^ Cynthia Talbot 2015, pp. 37-38. ^ Dasharatha Sharma 1959, p. 38. ^ Dasharatha Sharma 1959, p. 41. ^ R. B. Singh 1964, pp. 51-70. Anita Sudan (1989). A study of the Cahamana inscriptions of Rajasthan. Research. OCLC 20754525. Har Bilas Sarda (1935). Speeches And Writings Har Bilas Sarda. Ajmer: Vedic Yantralaya. Iqtidar Alam Khan (2008). Historical Dictionary of Medieval India. Scarecrow Press. ISBN 9780810864016. This page was last edited on 1 April 2019, at 04:47 (UTC).